© Serana et al. ; Licensee Bentham Open. Naïve, central- and effector-like memory regulatory T cells (Tregs) were evaluated in untreated and long-term antiretroviral-treated HIV+ patients that showed comparable CD4+ cell levels, while being, respectively, viremic and aviremic. In the untreated patients, the percentage of naïve-like Tregs was significantly increased to the detriment of central memory regulatory T cells. This redistribution of regulatory Treg subsets may contribute to explain the partially preserved CD4+ cell counts seen in these patients despite the ongoing viremia. On the contrary, in the long-term treated patients, the percentages of Treg subsets were similar to those of healthy donors, demonstrating a restored Treg homeostasis. The characterization of Treg subsets, rather than an evaluation of the total Treg population, may lead to a deeper understanding of the Treg role in HIV infection and therapy. Keywords: HIV, regulatory T cells, combined antiretroviral therapy.. The pathogenetic role of natural regulatory T cells (Tregs) in HIV infection is still ill defined. Treg-induced suppression can be deleterious for the development of an efficient anti-HIV specific immune response, but it may be also helpful in preventing an inappropriate immune activation [1,2]. Indeed, the increase of Tregs in HIV+ patients has been linked to a reduced immune activation and low viral load  but the accumulation of Tregs in lymphoid tissues was also found to be associated with a high viremia , both in infected patients and simian immunodeficiency virus-infected macaques . The data about the frequencies of circulating Tregs in HIV+ patients are conflicting [5-7], most likely because of the different biological samples (whole blood vs separated peripheral blood cells) or patients being analyzed. For example, one study demonstrated a lower Treg frequency in viremic patients compared with aviremic subjects , while another showed an increased Treg frequency only in the viremic HIV+ individuals with a late-stage disease and with a reduced CD4+ cell number . Another explanation of these discrepancies relies on the different procedures employed for the characterization of Tregs: initially, they have been identified with a suboptimal CD4+CD25high phenotyping [10,11]; then, using the more universally accepted CD4+CD25+FOXP3+ phenotype, which requires an intracellular staining [3,12]; more recently, Tregs have also been identified as CD4+CD25+CD127low/− cells because of a low expression of the IL-7 receptor (CD127)and of a tight correlation with CD4+CD25+FOXP3+ cells [13-15]. The heterogeneity of the Treg subpopulations , which include the naïve- (CD45RA+) and memory-like (CD45RA−) subpopulations [13,17], should be also taken into account. Among naïve Tregs, the expression of the CD31 antigen, which identifies T cells recently released from the thymus , allows the identification of “recent thymic emigrants” (RTE)-Tregs, which are important in the context of Treg homeostasis [19, 20]. Memory Tregs, similarly to conventional central memory (TCM) and effector memory (TEM) T cells, can be further divided into central memory-like (TregCM) and effector memory-like (TregEM) on the basis of the chemokine receptor 7 (CCR7) expression [21, 22]. According to Menning et al. 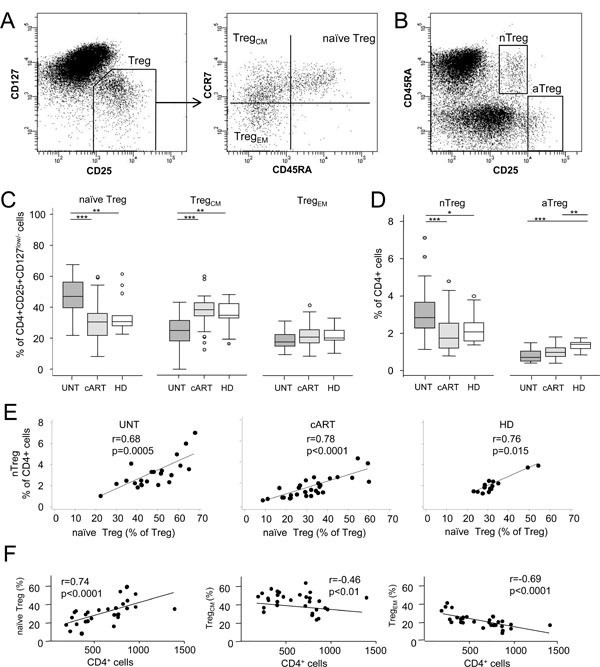 the expression of the homing receptor CCR7 differentially regulates the in vivo function of Tregs: TregCM control the onset of immune responses in lymphoid organs like conventional CD4+ TCM cells, while TregEM modulate the suppressive phase in peripheral tissues . Finally, according to the variable expression of FOXP3 and CD25 in CD45RA+ or CD45RA− cells, it is possible to identify two further subsets of Tregs endowed with different regulatory potential: resting Tregs (called rTregs  or naïve-like nTregs , depending on the study), which display the reduced suppressive capacity and properties of naïve cells, and activated Tregs (aTregs), which have an increased suppressive capacity and can be assimilated to memory-like Tregs [17, 20, 24]. To our knowledge, no studies have analyzed all these subsets (naïve Tregs, RTE-Tregs, TregCM, TregEM, rTregs, and aTregs) in HIV-infected individuals. Therefore, we quantified all Treg subpopulations in two groups of HIV-infected patients with similar CD4+ cell counts, one viremic but not requiring treatment because of a relatively conserved number of CD4+ cells and the other aviremic because of a long lasting (more than 6 years) combined antiretroviral therapy (cART), in order to investigate whether the modulation of the different Treg subsets could help explaining the preserved immunity observed in the first group of patients. Two groups of patients were investigated. The first included 22 viremic HIV+ patients, who did not require therapy according to the current guidelines because of a sufficiently conserved CD4+ cell count, and because they did not manifest clinical signs of opportunistic infections or tumours. The second comprised 30 aviremic patients (plasma HIV-1 RNA <37 copies/mL for more than 6 years) under-going long-term (>6 years) combination antiretroviral therapy (cART) with zidovudine, lamivudine, and lopinavir/ ritonavir, or tenofovir, lamivudine, and efavirenz, in whom the CD4+ cellular immunity was partially restored by stable therapy (Table 1). The study was conducted in accordance with good clinical practice (ICH-E6). The trial and amendments received approval by the institutional review board/independent ethics committee (resolution of n. 33 of March 11, 2011), and the patients provided written informed consent. Blood samples from 15 HIV− healthy donors (HD) were used as controls. UNT: HIV-infected patients not needing treatment; cART: HIV-infected treated with cART for more than 6 years. p: p-value obtained by the Mann-Whitney test. Treg subsets were determined by six-color flow cytometry on fresh whole blood obtained from untreated, cART-treated patients, and HD. Briefly, 100 μL of whole blood were stained with various combinations of optimal staining concentrations (previously determined by titrations) of allophycocyanin-H7 anti-CD4, fluorescein isothiocyanate anti-CD45RA (BD Pharmingen, Heidelberg, Germany), phycoerythrin anti-CD25, peridin-clorophyll protein-Cy5.5 anti-CCR7 (BioLegend, San Diego, CA), phycoerythtin-Cy7 anti-CD127 (eBioscience, San Diego, CA), and allophycocyanin anti-CD31 (Miltenyi Biotec, Bergisch Gladbach, Germany). The staining lasted for 15 minutes at room temperature and was followed by red blood cells lysis with BD Pharm Lyse™ lysing solution (BD Pharmingen). Data were collected using a BD FACSCanto II cytometer and analyzed with the FACSDiva software (BD Biosciences, San Jose, CA). Naïve, TCM, and TEM cells were respectively identified as CD4+CD45RA+CCR7+, CD4+ CD45RA−CCR7+, and CD4+CD45RA−CCR7− lymphocytes. Tregs, which were cells with a CD4+CD25+CD127low/− phenotype, were divided into: naïve Tregs, which were cells with a CD45RA+CCR7+ phenotype; TregCM, which were CD45RA−CCR7+ cells; and TregEM, which were CD45RA− CCR7− cells (Fig. 1A) [13-15]. RTE-Tregs were cells with a CD4+CD25+CD127low/−CD45RA+CCR7+CD31+ phenotype [19, 20]. Finally, the subsets of nTregs and aTregs were recog-nized as cells displaying, respectively, the CD4+ CD45RA+ CD25+ and CD4+CD45RA−CD25high phenotypes (Fig. 1B), whereas CD4+CD45RA-CD25+ were not considered in the analysis because they represent effector-like, cytokine secreting cells lacking suppressive capacity [20, 24]. Quantification of the Treg subpopulations. A. CD4+ cells, gated on lymphocytes, were first analyzed for the expression of the CD25 and CD127 surface antigens (Tregs defined as CD4+CD25+CD127low/−). The subsequent phenotyping based on the expression of CD45RA and CCR7 on the Treg population, as shown in the representative plot, allowed the distinction of Tregs into naïve CD4+CD25+CD127low/−CD45RA+CCR7+, central-memory-like (TregCM) CD4+CD25+CD127low/−CD45RA−CCR7+ and effector memory-like (TregEM) CD4+CD25+CD127low/−CD45RA−CCR7− populations. B. On CD4+ cells, naive-like nTregs were gated as CD45RA+CD25+ cells, and memory-like aTregs as CD45RA−CD25high cells. 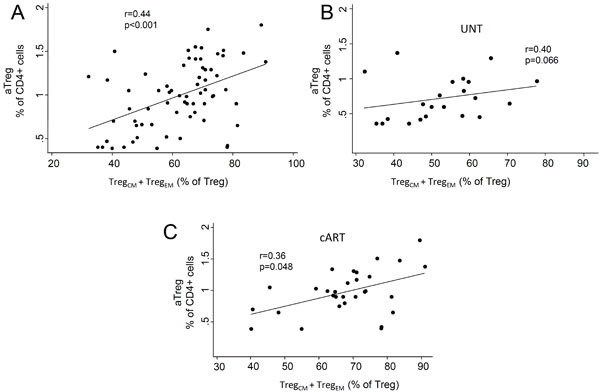 C. Percentage of Tregs with a naïve, TregCM, and TregEM phenotype in untreated (UNT), long-term combination antiretroviral therapy (cART)-treated patients, and healthy donors (HD). Horizontal lines indicate the significant differences between groups. The percentages of naïve Tregs, TregCM, and TregEM were also significantly different when compared within each group, exception made for the naïve Tregs and TregCM, which were not different within HD (significance lines not displayed). D. Quantification of nTregs and aTregs as a proportion of CD4+ cells in patients (UNT, cART) and HD. Horizontal lines indicate the significant differences between groups. E. Correlations between the measures of naive Tregs and nTregs in patients (UNT, cART) and HD. Lines obtained by linear regression analysis. F. Correlations between the Treg subsets and CD4+ cell counts in the cART-treated patients. Lines obtained by linear regression analysis. ***: p<0.001; **: p<0.01; *: p<0.05. Expression of CD127 in non-regulatory T cell subsets. Percentages of CD127low/− cells among naïve, TCM, and TEM CD4+ cells in untreated (UNT), long-term combination antiretroviral therapy (cART)-treated patients, and healthy donors (HD). Correlation between the percentage of memory Tregs (TregCM + TregEM) and aTregs in all patients and controls (A), in untreated patients (B), and in long-term treated patients (C). Lines are obtained by linear regression. UNT: untreated patients; cART: patients treated for more than 6 years with a combined antiretroviral therapy. ANOVA or the Kruskal-Wallis test, according to the normality of the data distribution, followed by the Dunn’s post-hoc test were employed to compare the percentages and number of Tregs and Treg subpopulations (which are reported herein as medians and depicted as box-and-whisker plots). Analysis of covariance was also employed to adjust for the effect of the age. The Spearman’s test was used to assess correlations. Statistical significance was set at p<0.05. The percentage and number of the total Tregs, identified as CD4+CD25+CD127low/− cells, did not differ in the untreated viremic and long-term treated aviremic patients from that of HD (7.8% vs 8.5% vs 8.6% and 47 cells/µL vs 45 cells/µL vs 55 cells/µL; p=NS). A similar result was found when an analysis of covariance was performed to adjust for the effects of age (not shown). Differently from the above, by analysing the Treg subsets we found a redistribution of these cells in the untreated viremic patients, with an increase in the proportion (but not in the number) of naïve Tregs at the detriment of memory Tregs and, in particular, of the TregCM cells. Indeed, these cells were significantly decreased both in terms of percentage (Fig. 1C) and total number (not shown), while only the total number, and not the percentage, of TregEM was reduced (data not shown). A differential redistribution of Treg subsets was also found when these cells were identified as nTregs and aTregs (Fig. 1D), which display features of naive-like and memory-like Tregs, respectively [17, 20, 24]. We found, in fact, a significant increase of nTregs only in the untreated viremic patients and a strong positive correlation between the percentage of naive Tregs and nTregs, both when data were analyzed altogether (r=0.83, p<0.001) and in each patient group (Fig. 1E). Likewise, positive correlations were present between the total percentage of memory Tregs (TregEM + TregCM) and aTregs (Appendix Fig. 1). These changes in the Treg subset redistribution were not due to the known effects of age on new T-cell production because the analysis of covariance did not detect any significant group-specific age-mediated effect (p=0.31), but confirmed that the population of naïve Treg cells was more represented in the untreated than in cART-treated patients and HD (age-adjusted means: 45.8% vs 36.6% vs 32.2%, respectively; p<0.001). The increased naive Tregs were not likely to result from an increased output of naive Tregs from the thymus because RTE-Tregs, which represent the subset of Tregs recently released from the thymus [19, 20], were not different in the three groups (4% vs 4% vs 4%, and 4.7 cells/µL vs 8.5 cells/µL vs 6 cells/µL; p=NS), even if data were age-adjusted (not shown). Thus, the present findings may be explained by a slow differentiation rate of naïve Tregs into TregCM and/or a preferential infection and killing of TregCM . Memory Tregs are in fact highly proliferative compared to their naïve counterparts, and in this situation, which favours viral replication , TregCM could represent a population more prone to apoptosis . Accordingly, we found that a higher viral load correlated with a lower percentage of TregCM (r=−0.51; p=0.016). Thus, an accelerated turnover of TregCM in conditions of high viral replication could drive a homeostatic expansion of naïve Tregs, whose proportion, in turn, was found to be positively correlated with the viremia (r=0.51; p=0.017). This interpretation implies the assumption that homeostatically expanded naive cells accumulated because unable to differentiate into memory cells, in contrast to what would be normally expected . Indeed, whereas this process is normally dependent on IL-7 stimulation , in naive Tregs of viremic patients the downstream parts of IL-7 signalling machinery are known to be disrupted . Alternatively, the reduced proportion of circulating TregCM in the blood of untreated patients could merely reflect an enhanced retention of this population in lymphoid organs. In fact, while TregCM and TregEM should not differ in terms of regulatory capacity , the differential expression of CCR7 empowers them to migrate to the lymphoid and the peripheral tissues, respectively, to perform their suppressive functions [22, 23]. In the lymphatic tissues, TregCM might underlie an increased immune suppression that would be responsible, on one hand, of a less efficient control of viral replication (shown by the residual viremia), and, on the other hand, of a lower degree of chronic immune activation, which, in turn, could explain the conserved CD4+ cell number present in the viremic patients even if untreated. Interestingly, this interpretation fits with observations made in African green monkeys infected by simian immunodeficiency virus . Differently from the untreated, in the cART-treated patients the percentage of naïve and TregCM were similar to that of HD (in whom TregCM is usually the most represented subset) . In addition, only in treated patients and not in the untreated (data not shown), a highly significant, strong positive correlation between the percentage of naïve Tregs and the CD4+ cell count, and an inverse correlation between TregCM and CD4+ cells were found (Fig. 1F). As already suggested by Simonetta et al. , this indicated that the relationship between naïve Tregs and the CD4+ cell count is restored by the long lasting cART. On the other hand, our data differ from those of the same authors reporting that the naïve-like Treg number was preserved in HIV-infected patients regardless of treatment . This discrepancy could be explained either by the different methodological approaches, or by the different HIV plasma levels in the patients of the two studies. The strong correlation found between the percentage of naive Tregs and the viral load (r=0.51, p=0.016) supports the second hypothesis. Therefore, although performed with different methodological approaches and type of patients, our study, at least in part, complements that of Simonetta et al. by demonstrating that a long lasting effective cART restores Treg homeostasis, most likely by hampering HIV replication in the periphery and into the lymphoid sanctuaries [30, 31]. It is also not straightforward to compare our results with those by Zhou et al. , who found that nTregs were greatly reduced while aTregs were increased in chronically infected, treatment-naive viremic patients (but not in those acutely-infected). Indeed, in the mentioned study patients were therapy-naive at the time of recruitment, and then started treatment because of disease progression, whereas our untreated patients were stable, chronically infected subjects never undergoing treatment throughout the study period. On the other hand, even if we could not perform a Treg quantification before treatment beginning, our findings in the long-term cART-treated patients are in agreement with those of Zhou et al. in demonstrating that the extent of post-therapy nTreg recovery relied on the amount of CD4+ cell number before therapy. Indeed, by stratifying our patients in two groups on the basis of the routinely-tested pre-therapy CD4+ cell number, we found that the higher median percentage of both naive Tregs (33% vs 23%, p=0.046) and nTregs (2.10% vs 1.23%, p= 0.010) was measured in the group of patients with a baseline CD4+ cell count over 200 cells/µL. In the context of our study, one concern may arise from the method employed to identify Treg cells, because the down-regulation of CD127 due to the HIV-induced chronic immune activation [32, 33] may lead to an overestimation of Tregs in viremic patients, when these cells are identified only according to the lack of CD127 and not to the presence of FOXP3 . However, also the more commonly used Treg marker FOXP3 is transiently up-modulated after cell activation in a fraction of effector, non-regulatory cells , and FOXP3+CD25+CD45RA− cells have also been reported to be non-regulatory . Furthermore, even in viremic patients, the overwhelming majority of CD25highCD127low cells have been shown to coincide with the FOXP3high population . To definitively rule out the possibility that our results could be technically biased, we analyzed the expression of the CD127 marker within the total naive and memory T-cell subsets. In contrast to the selective increase of CD127low/− cells within the naive Treg subset and to their decrease within the TregCM or TregEM subsets in the untreated viremic patients (Fig. 1C), an increased frequency of CD127low/− cells was found within the TCM and TEM subsets, but not within the naive one in the same patients (Fig. 2). This result indicates that the present findings are not an artefact mirroring the chronic immune cell activation typical of viremic patients, but are likely to represent a modulation of bona fide Treg cell subsets. In conclusion, we propose that the redistribution of Treg subsets contributes to explain the partially preserved CD4+ cell counts despite the ongoing viremia seen in untreated patients. Therefore, an analysis of the fine modulation of the Treg subsets, rather than a study of the total Treg population, should be performed for a better understanding of the Treg role in HIV infection and therapy. However, the heterogeneity of HIV patients and methods advocates the need of further studies, aimed at identifying the most appropriate Treg definition in the different subsets of HIV patients. This work was supported by grants from the Istituto Superiore di Sanità of Ministero della Salute (n.40H2) and from “Piano regionale Sangue” - Regione Lombardia. Chevalier MF, Weiss L. The split personality of regulatory T cells in HIV infection. Blood 2013; 121: 29-37. Fazekas de St Groth B, Landay AL. Regulatory T cells in HIV infection: pathogenic or protective participants in the immune response?. AIDS 2008; 22: 671-83. Epple HJ, Loddenkemper C, Kunkel D , et al. Mucosal but not peripheral FOXP3+ regulatory T cells are highly increased in untreated HIV infection and normalize after suppressive HAART. Blood 2006; 108: 3072-8. Estes JD, Li Q, Reynolds MR , et al. Premature induction of an immunosuppressive regulatory T cell response during acute simian immunodeficiency virus infection. J Infect Dis 2006; 193: 703-12. Baker CAR, Clark R, Ventura F , et al. Peripheral CD4 loss of regulatory T cells is associated with persistent viraemia in chronic HIV infection. Clin Exp Immunol 2007; 147: 533-9. Eggena MP, Barugahare B, Jones N , et al. Depletion of regulatory T cells in HIV infection is associated with immune activation. J Immunol 2005; 174: 4407-14. Schulze Zur Wiesch J, Thomssen A, Hartjen P , et al. Comprehensive analysis of frequency and phenotype of T regulatory cells in HIV infection: CD39 expression of FoxP3+ T regulatory cells correlates with progressive disease. J Virol 2011; 85: 1287-97. Del Pozo-Balado MDM, Leal M, Méndez-Lagares G, Pacheco YM. CD4(+)CD25(+/hi)CD127(lo) phenotype does not accurately identify regulatory T cells in all populations of HIV-infected persons. J Infect Dis 2010; 201: 331-5. Foxall RB, Albuquerque AS, Soares RS , et al. Memory and naive-like regulatory CD4+ T cells expand during HIV-2 infection in direct association with CD4+ T-cell depletion irrespectively of viremia. AIDS 2011; 25: 1961-70. Aandahl EM, Michaëlsson J, Moretto WJ, Hecht FM, Nixon DF. Human CD4+ CD25+ regulatory T cells control T-cell responses to human immunodeficiency virus and cytomegalovirus antigens. J Virol 2004; 78: 2454-9. Weiss L, Donkova-Petrini V, Caccavelli L , et al. Human immunodeficiency virus-driven expansion of CD4+CD25+ regulatory T cells which suppress HIV-specific CD4 T-cell responses in HIV-infected patients. Blood 2004; 104: 3249-56. Montes M, Sanchez C, Lewis DE , et al. Normalization of FoxP3+ Regulatory T cells in response to effective antiretroviral therapy. J Infect Dis 2010; 203: 496-9. Seddiki N, Santner-Nanan B, Tangye SG , et al. Persistence of naive CD45RA+ regulatory T cells in adult life. Blood 2006; 107: 2830-8. Hunt PW, Landay AL, Sinclair E , et al. A low T regulatory cell response may contribute to both viral control and generalized immune activation in HIV controllers. PLoS ONE 2011; 6: e15924. Lim A, Tan D, Price P , et al. Proportions of circulating T cells with a regulatory cell phenotype increase with HIV-associated immune activation and remain high on antiretroviral therapy. AIDS 2007; 21: 1525-34. Tenorio AR, Martinson J, Pollard D, Baum L, Landay A. The relationship of T-regulatory cell subsets to disease stage. immune activaion.and pathogen-specific immunity in HIV Infection. J Acquir Immune Defic Syndr 2008; 48: 577-80. Simonetta F, Lecuroux C, Girault I , et al. Early and long-lasting alteration of effector CD45RA-Foxp3high regulatory T-cell homeostasis during HIV infection. J Infect Dis 2012; 205: 1510-9. Kimmig S, Przybylski GK, Schmidt CA , et al. Two subsets of naive T helper cells with distinct T cell receptor excision circle content in human adult peripheral blood. J Exp Med 2002; 195: 789-94. Haas J, Fritzsching B, Trübswetter P , et al. Prevalence of newly generated naive regulatory T cells (Treg) is critical for Treg suppressive function and determines Treg dysfunction in multiple sclerosis. J Immunol 2007; 179: 1322-30. Miyara M, Yoshioka Y, Kitoh A , et al. Functional delineation and differentiation dynamics of human CD4+ T cells expressing the FoxP3 transcription factor. Immunity 2009; 30: 899-911. Sallusto F, Lenig D, Förster R, Lipp M, Lanzavecchia A. Two subsets of memory T lymphocytes with distinct homing potentials and effector functions. Nature 1999; 401: 708-12. Tosello V, Odunsi K, Souleimanian NE , et al. Differential expression of CCR7 defines two distinct subsets of human memory CD4+CD25+ Tregs. Clin Immunol 2008; 126: 291-302. Menning A, Höpken UE, Siegmund K , et al. Distinctive role of CCR7 in migration and functional activity of naive- and effector/memory-like Treg subsets. Eur J Immunol 2007; 37: 1575-83. Zhou H, Zhao H, Hao Y , et al. Excessive conversion and impaired thymic output contribute to disturbed regulatory T-cell homeostasis in AIDS patients with low CD4 cell counts. AIDS 2013; 27: 1059-69. Oswald-Richter K, Grill SM, Shariat N , et al. HIV infection of naturally occurring and genetically reprogrammed human regulatory T-cells. PLoS Biol 2004; 2: e198. Deeks SG, Kitchen CMR, Liu L , et al. Immune activation set point during early HIV Infection predicts subsequent CD4+ T-cell changes independent of viral load. Blood 2004; 104: 942-7. Boyman O, Létourneau S, Krieg C, Sprent J. Homeostatic proliferation and survival of naïve and memory T cells. Eur J Immunol 2009; 39: 2088-94. Juffroy O, Bugault F, Lambotte O , et al. Dual mechanism of impairment of interleukin-7 (IL-7) responses in human immunodeficiency virus infection: decreased IL-7 binding and abnormal activation of the JAK/STAT5 pathway. J Virol 2009; 84: 96-108. Santner-Nanan B, Seddiki N, Zhu E , et al. Accelerated age-dependent transition of human regulatory T cells to effector memory phenotype. Int Immunol 2008; 20: 375-83. Cellerai C, Harari A, Stauss H , et al. Early and prolonged antiretroviral therapy is associated with an HIV-1-specific T-cell profile comparable to that of long-term non-progressors. PLoS ONE 2011; 6: e18164. Guihot A, Tubiana R, Breton G , et al. Immune and virological benefits of 10 years of permanent viral control with antiretroviral therapy. AIDS 2010; 24: 614-7. Mercier F, Boulassel M-R, Yassine-Diab B , et al. Persistent human immunodeficiency virus-1 antigenaemia affects the expression of interleukin-7Ralpha on central and effector memory CD4+ and CD8+ T cell subsets. Clin Exp Immunol 2008; 152: 72-80. Kiazyk SAK, Fowke KR. Loss of CD127 expression links immune activation and CD4+ T cell loss in HIV infection. Trends Microbiol 2008; 16: 567-73. Allan SE, Crome SQ, Crellin NK , et al. Activation-induced FOXP3 in human T effector cells does not suppress proliferation or cytokine production. Int Immunol 2007; 19: 345-54.